To measure shear strength there are several shear test methods in existence for composite materials. They can be grouped by their way of force application (compressive force via rim of specimen, friction force via clamping system) or their required specimen geometry (with or without notch, miniaturised). Furthermore the tensile test can be modified to a shear test using fibre orientation of +/-45° and also the flexural test can be used to determin shear properties. All of the established methods have in common that testing provides reliable results for small shear deformations (<5%) i.e. small shear forces only. Dependable characterisation of high performance fibre reinforced composite materials gains increasing importance. We specialized in this field and additionally offer the innovative shear frame test described in DIN SPEC 4885. 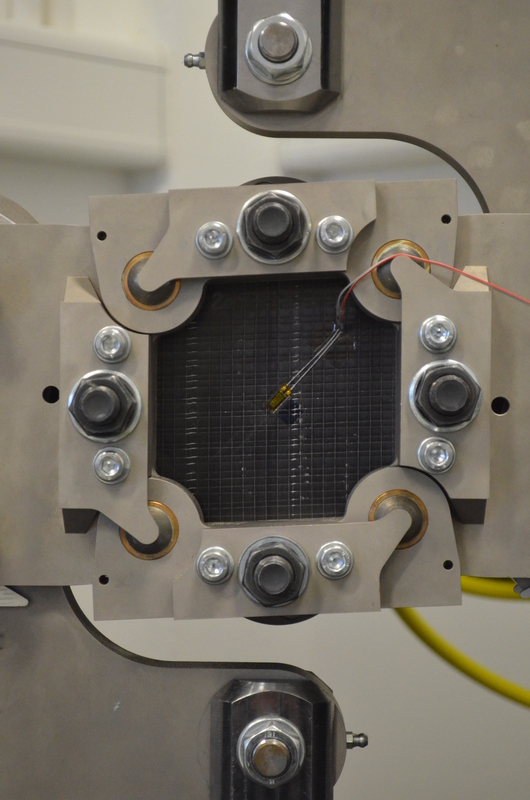 It was developed in collaboration with German Federal Institute for Materials Research and Testing (BAM). This method is tolerant to high deformation and thus compatible to measure high shear strength composite laminates. The shear test using DIN SPEC 4885 is a picture-frame shear test. Laminates with thermosetting or thermoplastic matrices reinforced with fibres in 0°- or 0°/90°- direction can be tested. The square shaped specimen is built symmetrically and balanced around the midplane. Typically the thickness of the specimen is 2 … 4mm. Shear strenght can be monitored in the linear as well as non-linear range of load-deformation-behaviour for shear deformations (slidings) larger than 5%. For the first time, maximum shear strenght even in this range can be determined. The all-side clampings prevent free rims and thus prevent load shifting effects. The results thereby show small variance usually less than 3%, which makes the method suitable for parameter studies or quality check. The single layers of the specimen exclusively see pure shear stress. It is distributed sufficiently homogenous over the specimen. The maximum shear stress is located in the center which typically is the location of failure. For the shear test using DIN SPEC 4885 we developed the picture-frame testing system GZ-S80. Hydraulic clampings provide quick and easy change of specimen. The testing routine takes only few minutes, so it can be integrated into industrial environments for shear tests series. The method is limited to small deformations only. Large deformations lead to load shift for horizontal fibre orientation. Shear stress decreases at the central region of the specimen (by 20% for longitudinal and by 10% for transversal orientation). There is no homogenious stress distribution in the cross section. The machining of the notch produces varying stress situations in the notch area which makes the specimen fail at different loads. The test applies concentrated forces to the specimen which can cause local crushing on the edges of the specimen. On the other hand, the Iosipescu method provides an inexpensive and flexible way of testing shear strength. Varying laminate orientations can be tested easily using only one testing method. There is no homogenious but parabolic stress distribution in the cross section. Specimen of multiaxial or parallel to load direction oriented fibres include fibres not connected to the clampings, which leads to unwanted effects. ASTM D 7078 uses a notched specimen. The stress distribution is strongly influenced by the manufacturing of the specimen. For using ASTM D 4255, several holes must be drilled into the specimen in the clamping region, which leads to stress concentration. On the other hand, the rail shear test method is a system of low complexity which uses simple and flat specimen. The method is limited to small deformations only (<5%). Large deformations lead to load shift for horizontal fibre orientation. The resulting stress condition in the specimen is multiaxial. The single layer see normal stresses as well as shear stresses. The stresses vertical to fibre orientation additionally cause break between fibre loads which influence the characteristic shear values. Owing to the principle, determining shear strength can’t be done error free. The free rims of the specimen cause load shifting effects. The load distribution must be assumed to be inhomogenious over the entire specimen width. On the other hand, the testing routine is impressivly simple. It basically modifies the established tensile test using a smart fibre orientation to create shear stress. We use a traction device for alternation loading (R=-1), tensile pulsation loading (R=0) or compression pulsation loading (R=-∞). The fibre direction configuration specifies the type of stress: longitudinal or lateral for tension and compression, +/-45° for shear tests. In order to prevent early fibre buckling, we use the Anti-Buckling Test Fixture GZ-BS32. For characterizing the dynamical flexural material properties we use our 3-/4-PointFlexural test fixture GZ B-50. Here, too, tensile and compression properties can be investigated using fibre orientation. We monitor the fatigue behaviour of the material of your choice, e.g. thermoplastics or thermosets, reinforced with carbon or glass long or continuous fibres, performing endurance stress/ operational reliability tests and generating “Wöhler” curves of your specific material configuration.